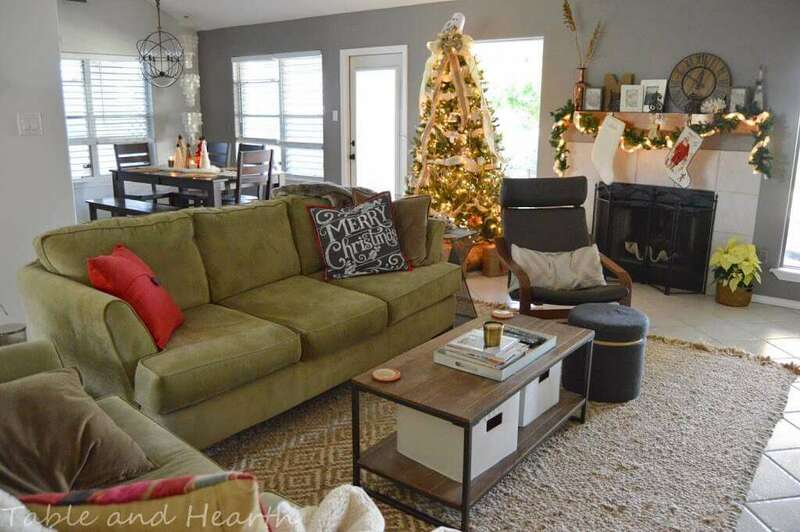 You guys, I am so excited to kick off the Home for the Holidays Blog Hop this morning! 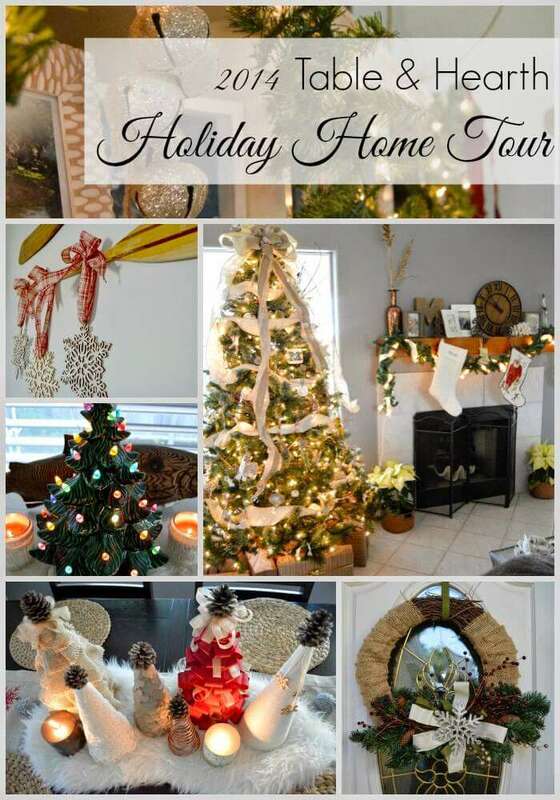 I just couldn’t let my first holiday season as a blogger go by without a tour, so myself and 18 other super talented bloggers are welcoming you into our homes to get a peek at how we like to decorate with our own personal Christmas styles. I can’t wait to see all of their unique spaces! 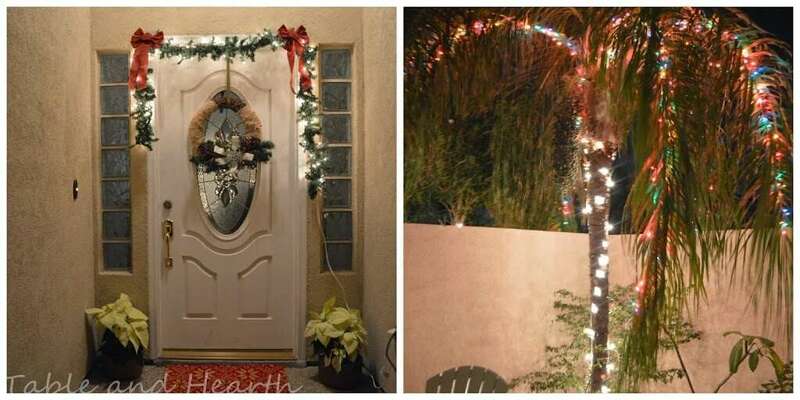 For us, Christmas is by far our favorite time of the year and we love to decorate, however, we don’t go too all-out crazy cause we don’t have alot of space (or attic) so we stick to decorating the main areas of the house, outside and the living room and dining room. So to start, here’s our decor on the outside. This is the one time a year that I appreciate that wall. 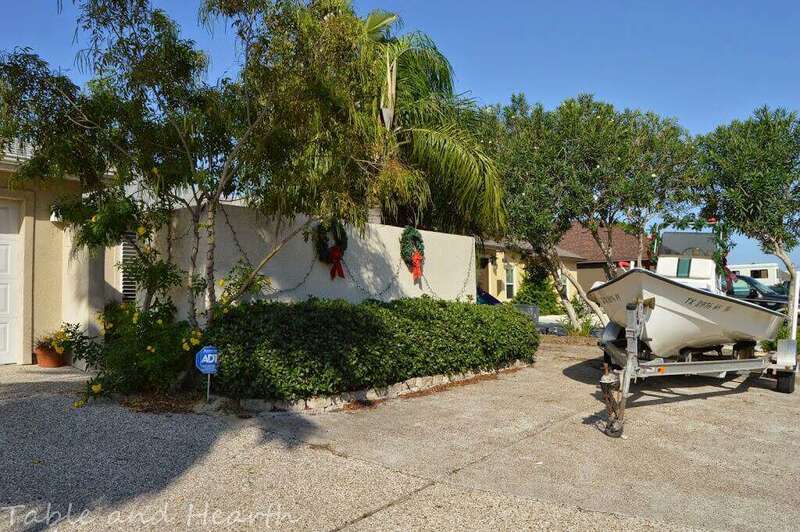 And until I can convince Matt to let us enter our little boat in the lighted boat parade, I have to settle with garland and bows on it :) Oh, and it’s just not right taking pictures of Christmas decor when it’s 80 degrees outside, at all. And then inside. Our living room and dining room are one big open space so that’s where I focus all of my decorating. I don’t decorate the guest rooms just because I don’t really want to store more stuff plus we don’t have alot of guests anyway :) I don’t do the kitchen either for the same reason which is good, cause I also had to cook 10 dozen cookies for work today while I was taking these pictures and it was a disaster zone! I love mainly white Christmas decor with pops of rich reds, again, not alot of stuff, just some garlands, pillows, and centerpieces. The pillow shams are from Pottery Barn. Aside from always being cute, I get their pillow covers so I can just pop them over my everyday pillows and all I have to store is the cover. We don’t use our fireplace so I have a faux clamshell in there filled with those cinnamon pinecones. 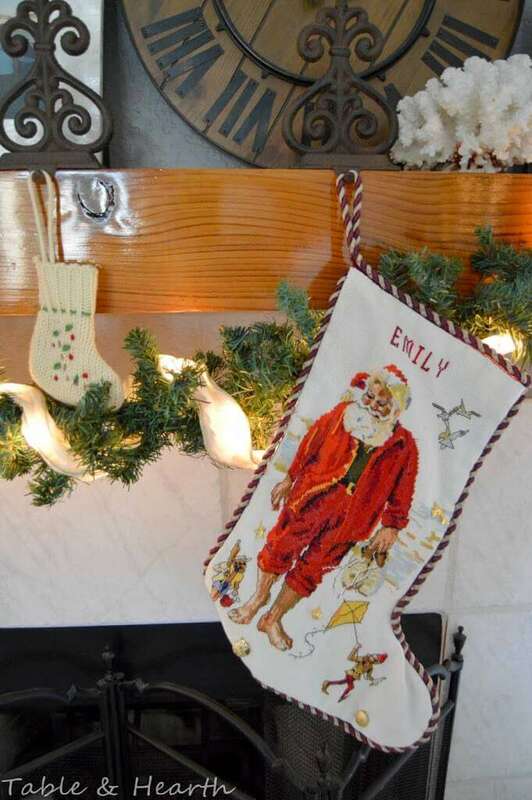 And always with the disguise-the-tree-timer poinsettias :) My mom cross-stitched me my beachy Santa stocking and she’s got a fishing Santa for Matt that I need to get down here, and then there’s Lily’s little stocking too. We got a new, bigger tree, with pinecones, from Home Depot on Black Friday last year (this one), and I LOVE it. 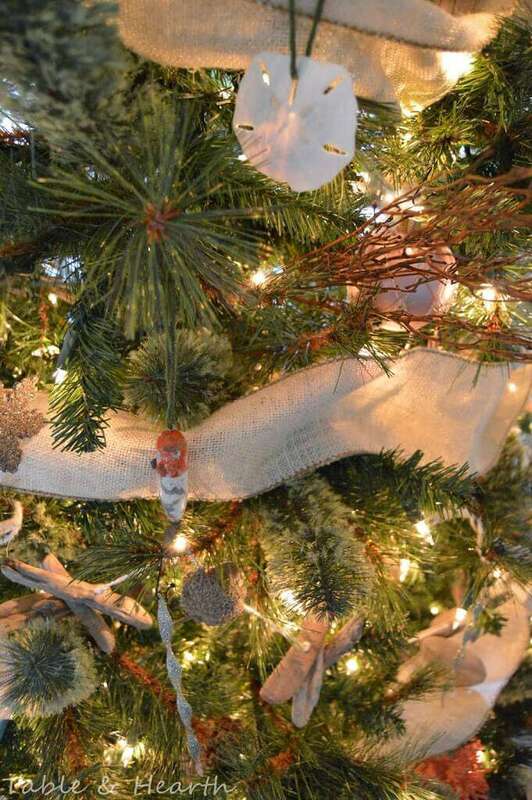 Our tree used to be super beachy but now is more just a little beach with neutral and rustic whites and burlap ribbon. There are still some DIY shell ornaments (of course) along with my acorn and driftwood garland and I got on a kick a few years ago of stringing up antique lures as ornaments also. 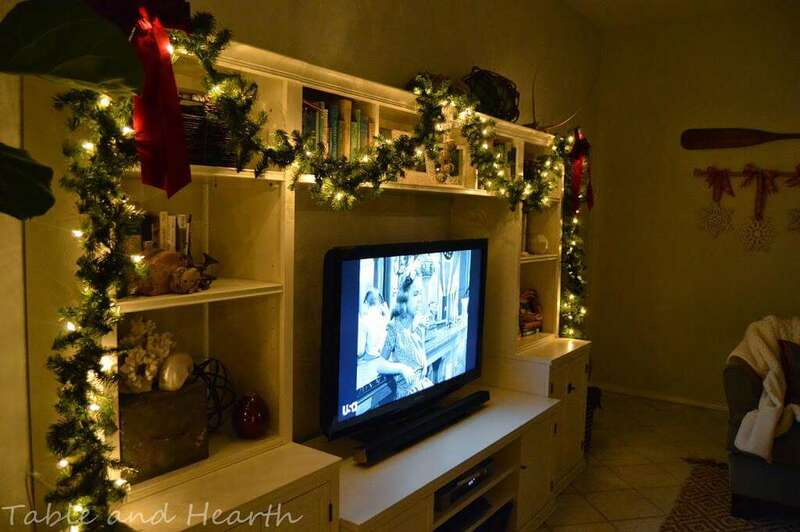 The rest of the living room just has a long garland over the entertainment center and some wooden snowflakes from World Market off of one of our oars. 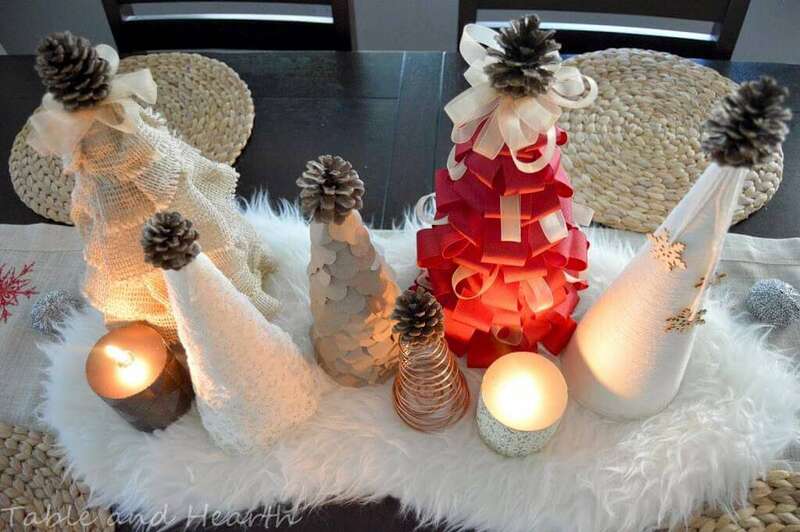 I guess I have a tree “theme” in our dining areas, with a cluster of DIY cone trees on the dining table and my grandmother’s porcelain tabletop tree on the breakfast nook table. I remember getting to “decorate” this tree as a little girl and to this day I still obsess over same colors being too close together on it. Oh, and I couldn’t resist those fair isle pillows from HomeGoods! And what’s some Christmas decor if you don’t see it at night?!? Thanks so much for stopping by and get ready for the other eighteen tours this week! 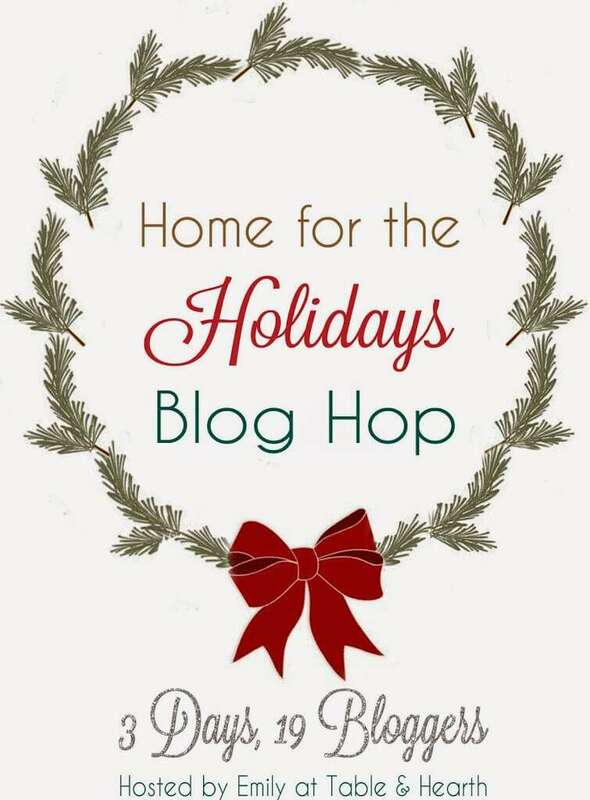 Also check out #HomeForTheHolidaysBlogHop to catch snippets of everyone’s tour. These ladies are going to have some great inspiration! It’s beautiful! I love love your little gray christmas pillows! You look like you live in tropical paradise! Let’s house swap sometime ;) Cheers! Ha! Thanks Karisa! Tropical? yes…paradise? notsomuch. I love cold, wintery christmases so I would totally take you up on that! Thank you Laura! I hope they have them, mine had some green ones too but I loved the gray ones of course. I am so glad you could join in, your home is beautiful!!! Thanks for the tour Emily! Everything looks great! 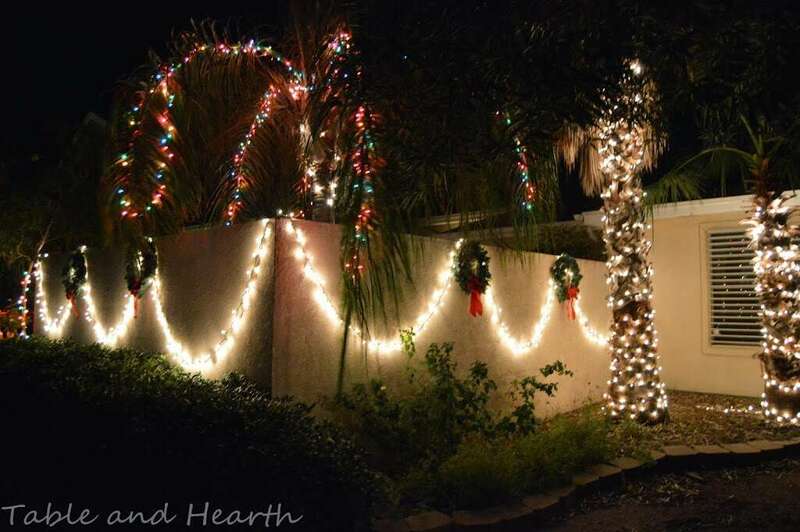 I love your home all lit up (palm trees at Christmas time!!)! It’s so pretty! Also.. It’s a Wonderful Life on the TV… nice touch! :-D Such a classic! Thanks for hosting! You have SUCH a pretty home Emily!!! LOVE seeing it all lit up for Christmas! You’re so sweet Kristi, thank you!! 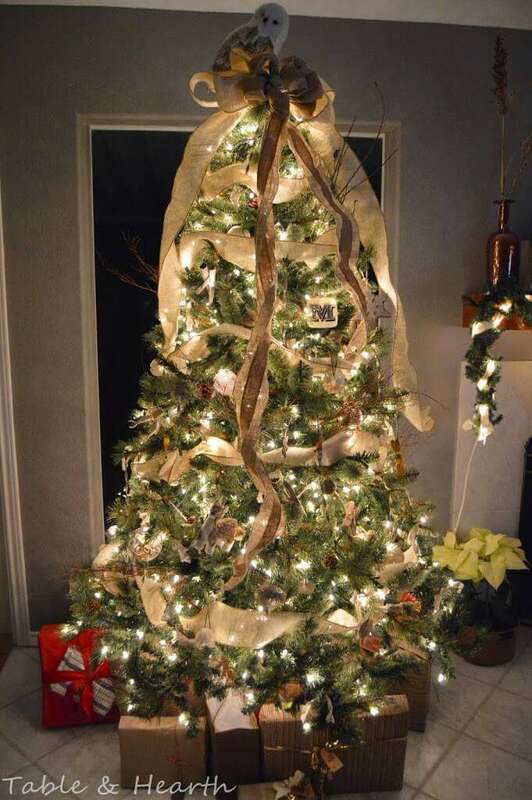 Your tree is gorgeous!! It looks very professional. 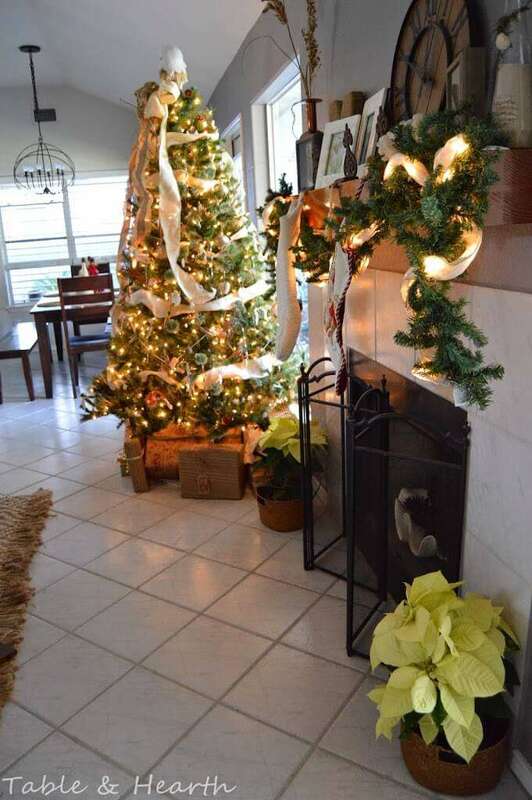 It’s amazing what a bunch of big ‘ol ribbon can do in place of a garland! Thank you Eryn! So lovely Emily! And, LOVE the classic ceramic light up Christmas tree on your table top! We have the same one in my family. I love seeing it every year — brings back such great childhood memories! Awesome Jen!! Such good memories :) Can’t wait to see yours on Friday!! Holy smokes, Emily!! Your home looks SO beautiful inside and out! So impressed; nice job!! Aw, thank you Shannon :) Can’t wait to see yours on Friday!! Emily, I love your Christmas tour! Thank you for hosting this fun blog hop! 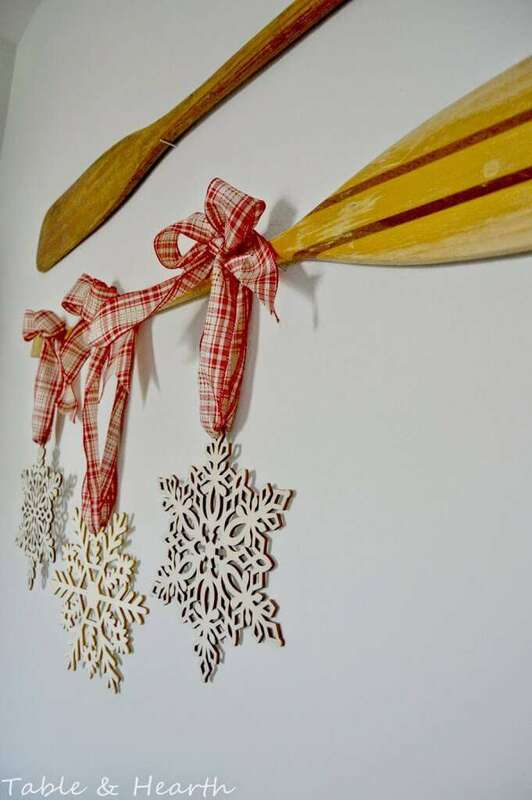 I think my favorite thing is the snowflakes you hung from your oar – that is just so creative and such a fun touch! Merry Christmas! Emily, it looks great! 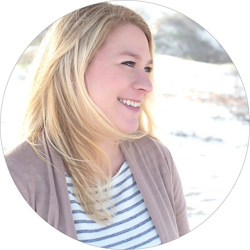 Thanks for hosting this fun blog hop! I can’t wait to see what everyone has in store. Me either!! I’m so glad all of you guys are on board, it’s so fun! Everything looks so pretty Emily! 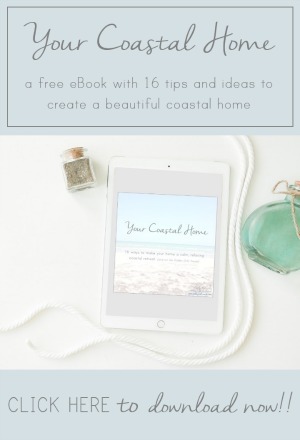 I love your coastal style, especially the white coastal Christmas tree – just gorgeous! Thanks so much for inviting me to participate in the tour – I had a blast! Thanks Amanda :) Matt just couldn’t understand why I was cutting up our Ikea faux sheepskin from our bedroom :) I would sooo love some cold and snow right now though, this having the AC on and getting swarmed by mosquitoes in December is for the birds! 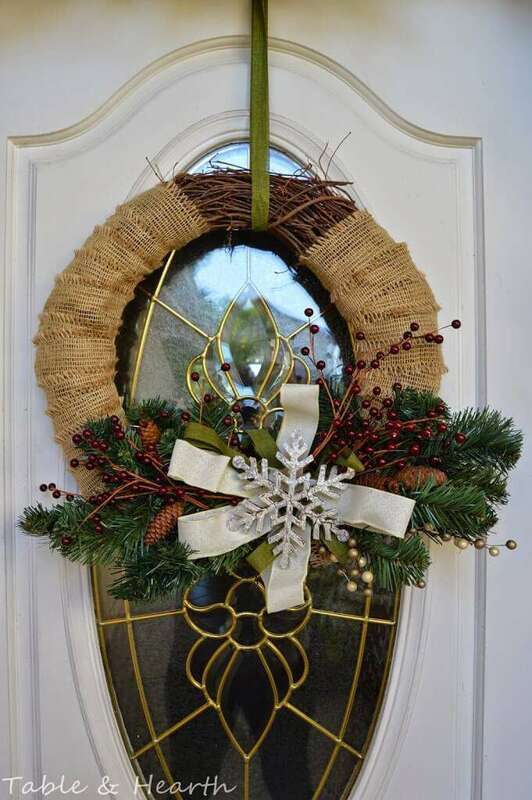 Your home looks lovely all decked out for the holidays! 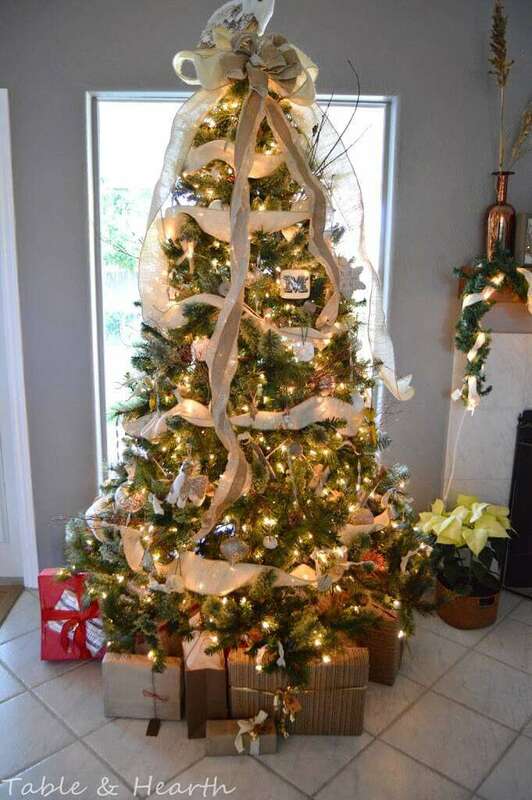 The tree(s), the mantle, the tablescape, even your boat – love it all! Thanks so much for hosting, Emily – I can’t wait to check out the rest of the homes on the tour! Me either Amy, and thanks! 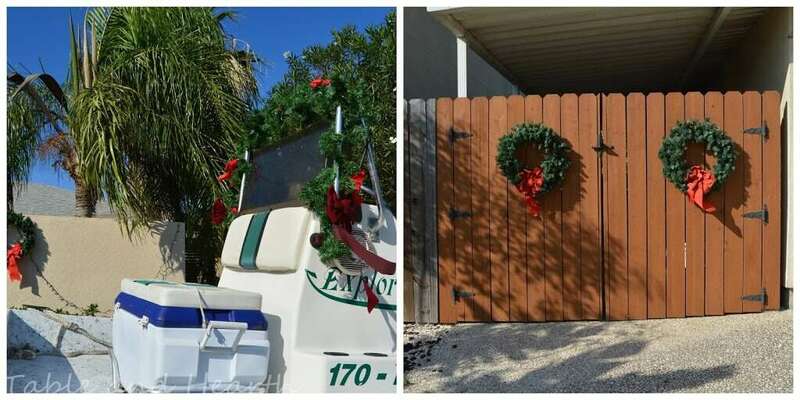 I sneak extra decorations on the boat each year ;) Someday it’ll have lights! Thank you Cat :) I just can’t help mixing it in! Christmas is definitely a bit different down here :) I do love me some lights in palm trees but I’d rather have some snow! Thanks so much for stopping by Lindi!! Beautiful! 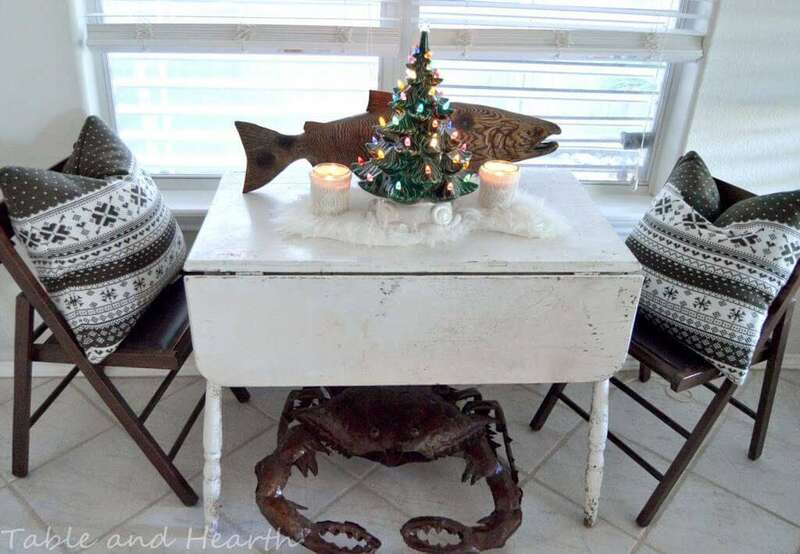 Love your mantel and the crab! Thanks Kimberly, Merry Christmas to you guys! 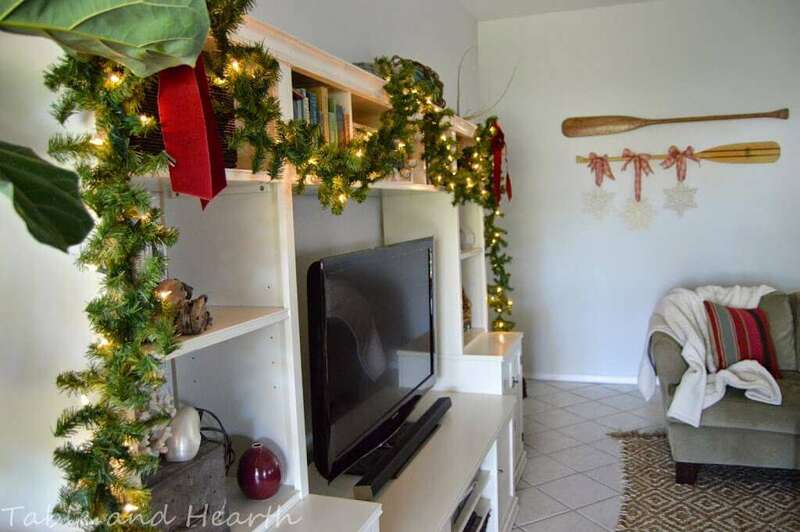 Such a cute coastal Christmas house!! Aw, thank you Julie! Merry Christmas!